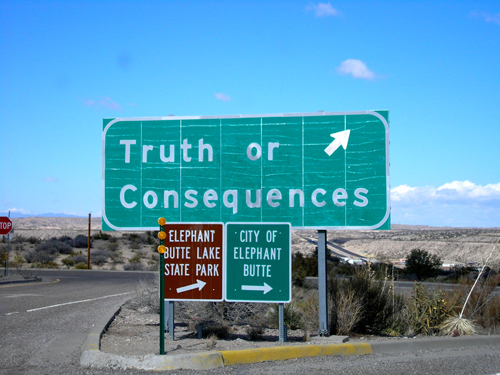 Road sign near Truth or Consequences, New Mexico. My father [Duke Leto Atreides] once told me that respect for the truth comes close to being the basis for all morality. “Something cannot emerge from nothing,” he said. 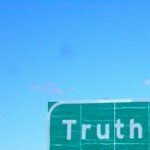 This is profound thinking if you understand how unstable “the truth” can be. — Paul Atreides as recorded by Princess Irulan Corrino in Conversations with Muad’Dib. Cited by Frank Herbert in Dune, (New York: Ace Books, 2005), p. 204. First published (Philadelphia, Pennsylvania: Chilton Books, 1965). Cited in part by Craig Michoski in private email. Posted on behalf of Frank Herbert, Leto Atreides, Paul Atreides and Irulan Corrino on Wednesday, September 8th, 2010 under Quotations.